Whether you’re simply weighing in with some helpful feedback or taking the reins at the request of your parent, these steps will help both you and your parent with the process of finding the perfect senior living community. Astronomer Carl Sagan famously said that there were more stars in the universe than grains of sand on all of Earth’s beaches. At the beginning of a search for a retirement community, sometimes it can feel like there are also more community options than grains of sand on the beach. One excellent way to narrow down the pool of senior living communities is to pick which type of senior living community is right for your parent. Senior Apartments. 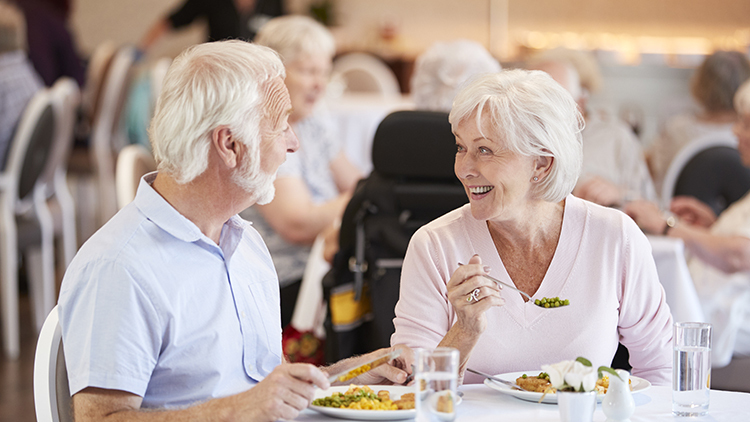 Senior apartments typically refer to independent living apartments that may be subsidized or “affordable.” They don’t usually include many amenities beyond a community room and perhaps a part-time staff person to manage the building. Life Plan Communities. A Life Plan Community is a senior living community type that offers tiered lifestyle and healthcare options all on one campus, including independent living, assisted living, and skilled nursing. It provides active lifestyle options to older adults through comprehensive services and amenities. 55+ Communities. Similar to senior apartment communities, 55+ communities offer housing options to older adults. Unlike senior apartment communities, they will likely include programs, activities, and common area maintenance. Independent Living. Independent living typically refers to a standalone apartment building for adults who are able to live independently. 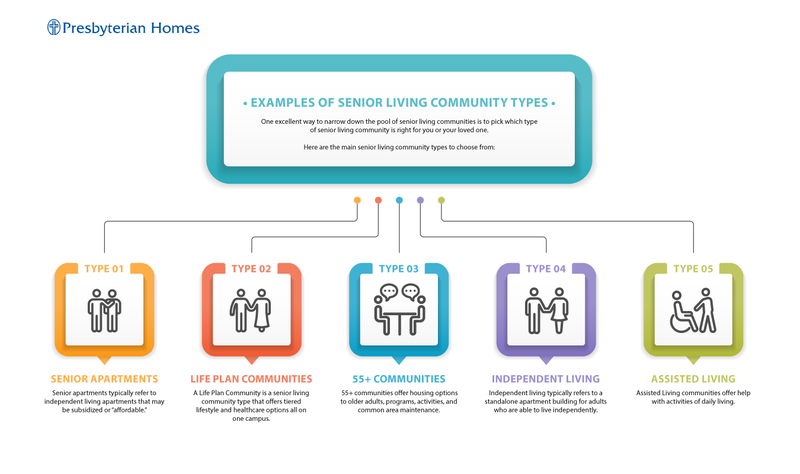 Some communities, like Life Plan Communities, incorporate independent living into the community as a whole. Assisted Living. Assisted Living communities offer help with activities of daily living. As with independent living, a community could offer assisted living only, or offer it as part of the larger continuum of care. Also note, assisted living is not the same as a nursing home, which is geared toward providing skilled nursing care. Related: Which Senior Living Option Is Best? Early on in the process, it’s important to have a conversation with your parents about their health. Keep in mind that independent living communities often have health requirements in place to ensure that residents are indeed able to live safely on their own. Even if they’re healthy and active now, that doesn’t mean they aren’t a good fit for a senior living community. In fact, that’s a sign that it’s time for independent living. Making the move is much easier when in good health. Additionally, why wait to enjoy all of the convenient services and exciting lifestyle options the community has to offer? Maybe it’s the thriving art scene. Perhaps it’s the rich cultural history. Or maybe it’s just that really great restaurant you love to go to on Friday evenings. Now is the perfect time for your parent to evaluate what they want from a home base. Do they want to be close to you and the grandkids? Would they prefer to stay within their current community? Or would they rather explore a new city they’ve always dreamed of moving to? Choosing a location (or a few locations) will help further narrow down the search. Help your parent research things such as climate, culture, crime rate, and walkability. If they haven’t done so already, you may want to suggest that your parent sit down with their financial advisor to determine how much they can afford each month for living expenses. 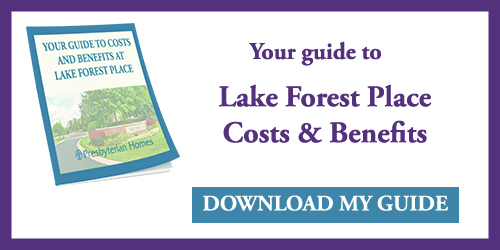 Although it’s difficult to know how much each community will cost given the variations in contracts and the different fees associated each, it will be helpful to know what your parent can afford from the get-go. What services are included in my monthly fee? The first two questions will help determine the value of the monthly fees. The last question will help you determine the financial stability of the organization. According to Brad Breeding of MyLifeSite, “average fee increases of 3-4% per year are not uncommon in the industry.” Anything significantly above that range should raise questions. Senior living communities offer a whole host of amenities and services to help residents live active, fulfilling lives. The trick is to figure out which amenities and services your parent will actually enjoy. For example, maybe a community offers world-class tennis courts. If your parent is an avid tennis player, that’s great! However, if they haven’t picked up their racket in 30 years, the tennis courts shouldn’t hold much sway over their decision-making process, no matter how flashy. The last (and most important) step is to tour the communities your parent is considering. They may appreciate it if you offer to go with them so they can have an extra set of eyes and a fresh opinion. Your parents don’t want to live in a place that’s depressing or institutional—they want a place that’s modern and beautiful. Visiting the communities will help you see the physical space. It will also help you and your parents get a feel for the people in the community. Are they welcoming? Do they seem like people your parents would get along with? Want to Learn More About Senior Living Communities? The search for a community can be time-consuming and confusing. That’s why we tackle questions each week to help guide you and your parents through the process. Follow our blog for more helpful information or feel free to contact us with any questions.